…without Borders | "…but I'm not the only one…"
They’re comparing dollar amounts between countries, percentages per capita, percentages of the total aid sent so far. Who’s given the most? Wow, Israel’s doing this? How many troops have WE sent compared to how many troops THEY’VE sent? Obviously THEY are sending this because of (name political outcome goal here). Let’s analyze this leader’s words about the earthquake (on a side note, my analysis of Pat Robertson’s words: STFU). This is Robin Frisella, reporting from the comfort of my kitchen, where I have electricity, a phone, food, and a roof over my head. The most horrible tragedy has occurred and killed maybe two hundred thousand of our brothers and sisters. Those who survived the quake are bleeding, crying, and dying from thirst. They are trapped alone under buildings. They are looking for their mommy and daddy. Shame on the media outlets, once again, for looking for a way to gain ratings by inciting discord. Shame on anyone who is listening to that drivel. Take notes when the Aid organizations are listed, take a pee break when the talking heads start deciding who’s the biggest giver, or speculating on the political motive behind each country’s donations. THEY (WE) ARE GIVING WHAT WE CAN, AND THEY (WE) ARE GIVING BECAUSE WE CARE. We are giving because we don’t want our two-story houses to collapse upon us. We are giving because we can’t imagine what a disaster of this magnitude would do to us. We are giving because in between the analysts, we see the photo of the little girl who is in the hospital clutching her doll with her unbandaged fingers. We are giving because we can imagine how it would feel to be on top of a pile of rubble, desperately digging with bare fingers to get to our child. Please don’t use this situation as a springboard for hateful political discourse. Don’t cut border lines into an already wounded world. Use the situation to discuss building bridges (literal and figurative), infrastructures, temporary hospitals and housing. We can sit here in our comfortable homes and make all kinds of assumptions; I guarantee you that on this suffering island neighbor, no one is checking for the country of origin of the first responder next to them, or of the surgeon they’re assisting, or of the one holding out the hand to pull them from the wreckage. 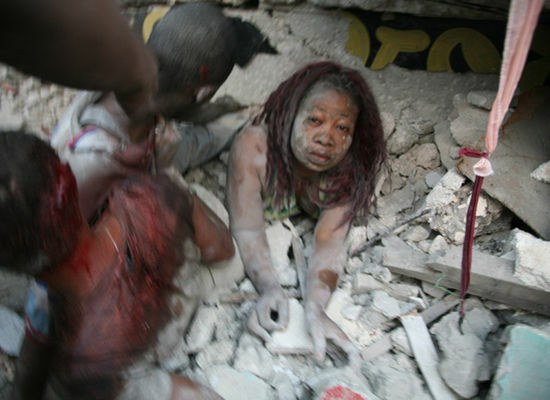 In Haiti, in the middle of that chaotic nightmare, everyone there knows: this didn’t happen to “the Haitians-” it happened to our fellow Humans. Next > …what was that Statue of Liberty thing again? beautifully stated and sadly needed to be said.